kandeej.com: How to keep make-up from melting off! Oh no, it's summertime! It's hot. Maybe you live somewhere really humid, sticky, and sweat inducing! What do you do when you took all the time to get all glammed up, then your make-up vanishes into thin, hot, air!!! Or scenario #2, you are trying to look cute, and like you have no make-up on at the beach, but you really do have a little make-up on, and you want it to stay looking that way. Whether your splashin' in water or cooking on the sand. or #3, you are getting married, and you don't want your make-up coming off all Kid Cudi, DAY and NIGHT. Or you don't want to sweat or cry it off either. Dun-duh-duh-duh (read that in a here-comes-the-super-hero way)! Your faithful-hollywood-celebrity-make-up-artist-homegirl, is here to help! so does Oprah and Tyra! You just spray this on after you've finished your make-up, and your face is now sweat proof and water-resistant. It won't clog your pores, but will keep you lookin' fab. I wore it on the hottest, humid days in NYC in August, and make-up didn't go anywhere! 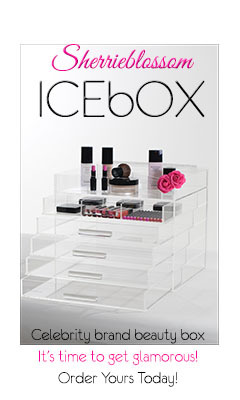 I use this on set and on brides, to make sure their make-up doesn't melt away! Urban Decay's All-Nighter Spray, the All-Nighter spray guarantee's your make-up to last for 16 hours! You can dance, sweat, soak in your jacuzzi overlooking the city at your mansion, and none of your make-up is going to melt or drip off! The BEST part about Urban Decay's All-Nighter is that, it is free of PARABENS, FRAGRANCE, OIL, it's VEGAN and cruelty FREE! (It's also been allergy tested.) I used this on a tv show appearance I had a couple months ago, and my make-up looked just as fresh when we finished a whole day of taping, as it did when I put it on in the morning! Another problem solved by your make-up super hero, Kandee! kandee! ur the best u inspire me so much! Kandee I use the Ben Nye theatre make up fix spray...is it the same or is the one you suggest more appropriate for everyday makeup? Thanks a million sweety, love your blog and videos!!! PS. The`"Model-in-a-Bottle" link isn't working. i wanted to tell u that u inspire me to be what i wanna be. u must hear this all the time, but ur really amazin! i wanna be a makeup artist too, and u inspire me to follow my dreams, i had my baby at a young age too and i dropped out og high school, watchin ur videos made me realize how important it is to follow my dreams! i wanna know how u kept going on, everyone tells me i wont be anything bcuz of my "poor" choices...im going to skool next year to finish fyi bcuz of you :) i love u! the link is beacause that's the cheapest price online! Will this work for oily skin though? Your the best! Im going to try that Model in a Bottle! You mentioned two products, im guessing use one or the other right? which one do you recommend the most? LOVE YA LOTS!!! I love you Kandee and I love all your posts especially those about inspiration and happiness it shows you as a really loving and caring person. I also love all of your youtube videos. I just started using the UD all nighter spray like last week, and i gotta say, it really is super amazing! Now we can look just as cute as you, hehe!! Thank you so much for the info...Im doing my first professional make up job soon for a wedding and this info is priceless. Your my inspiration and I hope to one day be as susccessful as you. Love that spray! I've tried and it really works great for summer. Its freezing here in australia now!!!! I'm from Turkey and all i can find is Mac. Thanks Kandee. I am getting married in Las Vegas in August. It's going to be super hot and steamy!!! I will definetly have to get Model in a Bottle. You rock! I am SO adding the Urban Decay spray to my wishlist! Thanks for the rec! <333! thank you kandee! definitely going to buy one of the two!! Thanks for posting this!!! I just ordered some model-in-a-bottle to try! my band plays at a SUPER HOT and sweaty music festival...so i'm hoping this will help me out! Great post- couldn't have come at a better time. I recently moved from California to the south to be with my fiancee, who is stationed here. The humidity is incredible and I was lamenting at how all my previous makeup favorites just don't work here! I'll be sure to try these out. awesome, ive been wanting and needing something like this for forever. i tried sparying my face with hairspray years ago .lol (silly i kinow). i just went sticky, shiney then crusty when i moved my face and smiled etc. does the mac fix + work the same way?? or no?? Kandee!! Both products seem to be really good, but now I don't know which one to get! Which one do you think I should get? The model-in-a-bottle seems to be really great considering tyra, oprah, and you all use it; however, the urban decay all nighter seems to be a newer product that also seems to work well. HELP!! Which one is better? Do you ever use coloured eyeliners (other than black)? I recently picked up a few blue and purple eyeliners, and I'm looking for some fun ideas. okay i just bought the urban decay one! i sure hope it works! Thank you so much Kandee! I am going to do makeup for a wedding i am in and would love any other stay put advice!!!!! !